The defeat of the attempted coup in Turkey is an important victory. The overthrow of the elected President Morsi in Egypt demonstrates the sort of fatalities and repression that follow such actions. This time, a mass mobilisation of the Turkish people opposed the tanks. This mobilisation was supported by the major opposition parties, the Republican People’s Party (CHP), the Nationalist Movement Party (MHP), and the pro-Kurdish People’s Democratic Party (HDP). In Egypt, the comparable parties supported the coup, and guaranteed the success of the counter-revolution. For Turkey, the united front of all those defending democracy was sufficient to stop the coup. 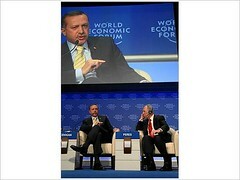 Prime Minister Erdogan of Turkey attacks Israeli President Peres over Israel’s assault on Gaza at the World Economic Forum, January 2009. 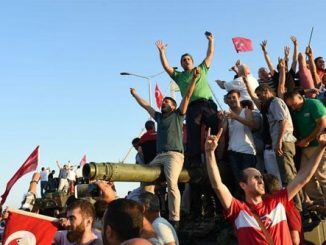 On Sunday 12 September 2010, the 30th anniversary of the bloody military coup in 1980, Turkey voted to accept constitutional amendments that have widely been viewed as moving the country away from the grip of the army. The turnout was 73.71%, of which almost 58% approved the reform package, whilst just over 42% rejected it. There was a high abstention rate of almost 27%, mainly as a result of the call by the main Kurdish party BDP for a boycott of the referendum. Since the election of the AKP (Justice and Development Party) government in 2002, and its re-election on a strong vote in 2007, there has been a power struggle between the army and the government in Turkey. There were several attempts, some covert and some very overt, to destabilise the government over the last few years.